Does the mere sight of your cluttered office keep you from your responsibilities? Are stacks of paperwork taking over your space? If the answer is yes, it’s time to get organized to increase your productivity and boost creativity. 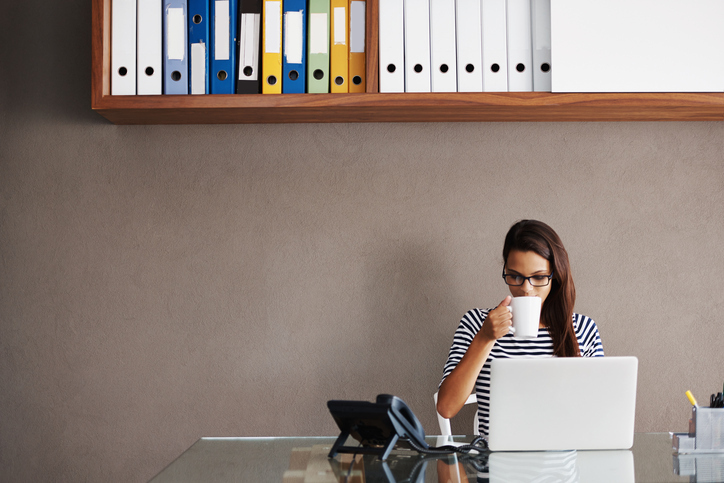 Try these five easy ways to clean up your workspace and make your life easier. Let’s face it, we all have stuff in our office that we will probably never need to use or even look at again. Begin by purging the things you don’t need. Go through that stack of dated magazines and recycle them. Work your way through the endless stacks of paper. File what you need and shred what you don’t need. It’s helpful to do a biweekly inventory and run through your office needs, while simultaneously getting rid of the unnecessary gadgets and trash. An uncluttered desk can lead to an uncluttered mind. Start by clearing everything off your desk and then only put back the things you absolutely need. Use desktop organizers to arrange your items. Small containers can hold paper clips and other supplies, while paper trays keep important documents handy. Try two of them: one for incoming project and to-do’s, and the other for papers to be filed. Use boxes to archive files and get them out of your way. Even your filing cabinet needs a break sometimes. Make a plan of transporting files from the paper trays, to filing cabinets, to stored boxes, depending upon need. Boxes stack better and are easier to keep out of your way once it’s time to archive. If your office is small, keep the boxes tucked away in your Space Shop Self Storage unit. By taking some time now to figure out your own efficient organizational system, you will save time in the future. The first step is to invest in a good label maker and label all of your files, drawers, and boxes. Then, develop a color-coded filing system. Use a different color for your financial, medical, personal, insurance, and household categories. This will make it easier for you to find what you’re looking for in a pinch. Is your office a mess simply because you are only thinking horizontally? Start thinking about ways to utilize storage space other than on your desktop. If you have a closet, put it to use. Keep the bottom free for boxes and build some shelves for loose items. Don’t forget stacking paper trays to organize your documents. Next, look to the walls. Instead of just hanging pictures, use bulletin boards, at-a-glance calendars, and cork boards to free up coveted desk space. Keeping a clean desk and an organized office space will allow you more time to do the things you want to be doing. So, tidy up that office, get your work done within a productive and calming environment, and get outside for some well-deserved fun. For your office space storage needs, contact Space Shop Self Storage today.